Sometimes, the stars all seem to align—you arrive at your hotel, weary from your travels, and check in at the front desk. The smiling clerk announces you’ve been upgraded, and you make your way up to your newly assigned suite, enjoying its luxuries for the cost of a standard double. What, this has never happened to you? It’s not mere fantasy—read on to find tried-and-true recommendations for getting upgraded for your next hotel stay. Don’t Be a Stranger. If there’s a hotel you visit frequently, make sure the staff knows you’re there and that you plan on returning again in the future. 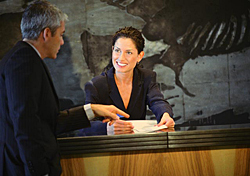 Be courteous and get to know the manager, front-desk clerks, and concierge. When you next make a reservation, contact the hotel directly, not a central reservations line. Before your arrival, get in touch with the property staff and let them know you’re arriving (offering a compliment on the property, service, etc., couldn’t hurt, either). Then, once you get there, politely mention your frequent visits and inquire if any upgrades are available. Is it a Special Occasion? Mention It! Are you traveling for a birthday, anniversary, or honeymoon? Be sure to tell the front desk staff. Oftentimes, to lure repeat guests and encourage good word-of-mouth, hotel staff will go out of their way to make special occasions even more memorable, and that may include an upgrade or other complimentary perk. Be Loyal. Joining a hotel’s loyalty program can go far toward getting you free upgrades and other benefits. Most programs cost nothing to join, keep track of how often you stay at a brand hotel (e.g., [[Hilton HHonors | Hilton]], [[Wyndham ByRequest | Wyndham]], [[Marriott Rewards | Marriott]], etc. ), record your preferences (non-smoking, rooms near an elevator, favorite snacks/refreshments), and also offer free stays (usually after a minimum requirement). Be Fashionably Late. The later in the day you arrive, the less chance there is that the hotel has filled up unused inventory (possibly including higher-class rooms than the one you booked). Just make sure you inform the staff you’re arriving late—if you don’t show up during standard check-in hours, there’s a chance the hotel may automatically cancel your reservation. Sweeten the Deal. My friend once got an upgrade at a Cancun hotel by smiling sweetly and slipping the front desk clerk a five-spot. Now, this may not work at every hotel, but it never hurts to offer an extra $10 or $20, if you think it may help. And a room upgrade for $20 or less, while not exactly free, still works out to be quite the bargain. What’s your favorite way to get a free hotel upgrade? Share your strategies by submitting a comment below!